What do you want your bank to do for you? Do you like your bank? Are you happy with the relationship you have with it? Does it behave in the way you expect? Do the interactions you have with it give you full satisfaction? Would you recommend it to a friend? 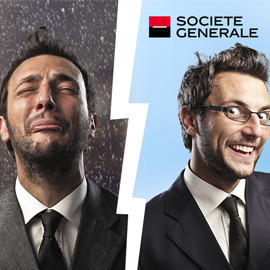 Société Générale is a French banking group with operations in 36 countries. They are pioneers in trying to improve customer satisfaction. The ambition of the International Retail Banking team is to offer the best experience to their clients in order to delight them. To do so, the first step is to understand what the key moments are and to know why they matter to customers. In a story made of two posters, show us the reality of your banking experience today. Choose an episode which angers you and one which delights you, either as you experience it or as you would like it to be. In both cases, tell us why these moments matter to you. Format: 4 pages: ‘Low moment’ poster and answers (page 1-2) and ‘Wow moment’ poster and answers (page 3-4).